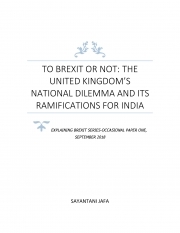 Description of "TO BREXIT OR NOT: THE UNITED KINGDOM'S NATIONAL DILEMMA AND ITS RAMIFICATIONS FOR INDIA (eBook)"
Brexit is almost a new acronym in the English language. Sayantani Jafa introduces in lucid analysis the background, sociology and political consequences for the United Kingdom's planned exit from the European Union. The author also points out to Indian readers an unbiased perspective to the opportunities in a post-Brexit era. SAYANTANI JAFA IS THE AUTHOR OF "UNCERTAIN IDENTITIES:"CRAFTWORK, WOMEN AND PATRIARCHY IN A VILLAGE OF EASTERN UTTAR PRADESH" AND "TUTTI-FRUTTI ON PARK STREET-VIGNETTES FROM A CALCUTTA CHILDHOOD". She is also a frequent contributor to many leading Indian newspapers and academic journals on socio-cultural issues. Her oeuvre is as varied as gender relations in South Asia to contemporary British politics. Reviews of "TO BREXIT OR NOT: THE UNITED KINGDOM'S NATIONAL DILEMMA AND ITS RAMIFICATIONS FOR INDIA (eBook)"